Eclipse Actuators quickly close toxic gas valves on 150-pound and ton cylinders in less than one second when activated by remote sensors. These electronic actuators are “close only devices” requiring an operator to visit the site to determine the cause of the problem. The operator can then correct the condition, check the facility, and then manually reset the valve before restarting the gas system. The Eclipse is a battery-operated actuator and allows an operator or remote gas sensor to shutoff leaking toxic gas without requiring the operator to enter the hazardous atmosphere. 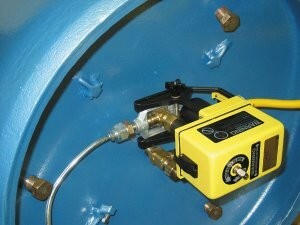 The chlorine valve can be opened or closed manually with the actuator installed and ready to operate. The Eclipse actuators are easily installed on existing, standard ton or cylinder hardware and can be tested by the operator on-site to assure correct operation.